The Marigold Industrial Flexitril L27 Chemical-Resistant Nitrile Gauntlet Gloves offer flexibility, dexterity and mechanical resistance. 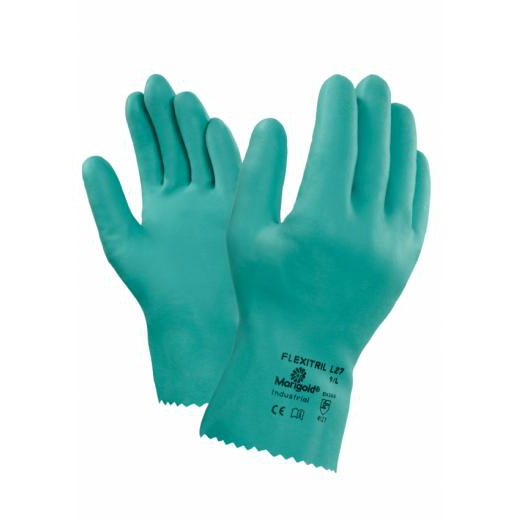 Featuring a coating resistant to chemicals, oils, greases, gasoline, petrol, alcohol, alkalis, and salts, these gloves are suitable for a diverse range of low-risk applications, including automotive repair, equipment maintenance, chemical handling, metal fabrication, cleaning and logistics and warehousing. The Flexitril 27 Chemical-Resistant Gloves are resistant to chemicals, oils, greases, gasoline, petrol, alcohol, alkali and salts, and feature extended cuffs to protect the wrists against liquid splash-back. As a result, these gloves are suitable for a variety of low-risk applications that involve the use (or handling of) any of these substances. The Flexitril Chemical-Resistant Gloves are available in a range of sizes to fit most users. Please consult the table below for details of the sizes, then make your selection using the drop-down menu at the top of the page. Please note that these gauntlet gloves have a length of 270mm.